The Hitachi KTM fuelled by Milwaukee team has announced its rider line up for the upcoming 2019 FIM Motocross World Championship and the Maxxis ACU British Motocross Championship. Dutchman Bas Vaessen will join current British Champion Conrad Mewse to compete in the MX2 category. Both riders will spend the year aboard potent KTM 250 SF-X machines, fitted with semi-factory engines. The bikes will be rapid and Team Principal Roger Magee fully expects the talented riders to push each other to their limits this year. After an injury riddled year in 2018, Graeme Irwin will return to racing in the MXGP category aboard his category leading KTM 450 SX-F. This year Roger expects Graeme to make up for a disappointing 2018 and find his way back to the podium once again. The new look Hitachi KTM fuelled by Milwaukee team are ready to race and will make their season debut at the Hawkstone Park International on 17 February. Here at AMS4KTM we’re proud to stock the same bikes that have carried so many of KTM’s riders to championships over the years. The KTM 450 SX-F is the cream of the crop, providing unrivalled power and performance in the 4-stroke category. The bike consistently outperforms its rivals and helped Jeffrey Herlings claim the 2018 MXGP World Championship with one of the most dominant seasons of riding the motocross world has ever witnessed. 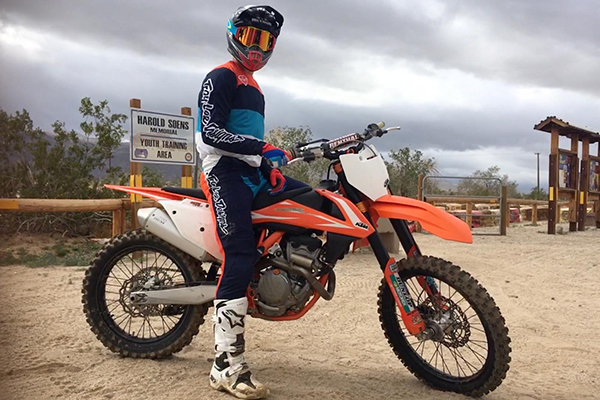 The KTM 250 SX-F is the 450’s lighter, more agile brother. It’s power to weight ratio makes it a potent threat on the race track and took Spanish prodigy Jorge Prado to this year’s MX2 world title. For more information and to chat all things KTM, pop into our Tewkesbury showroom or call our KTM experts on +44 (0) 1684 297979.